TODAY'S ITEM has been delayed by drunkenness among the crew. OK, we 'fess that like the Ark (Noah in Genesis 9:21, the first intoxication on record) it was the captain who was the offender. Just kidding, but while were out researching a forthcoming item, Dairy Queen desserts of the most disgusting kind were eagerly consumed. Tony Sainsbury seems to have a preference for walking in the absence of crowds, and often comments on his good luck in finding quiet paths even on holiday weekends. Recently he traversed the valley of Longsleddale (in the way of the native speakers of the area you may pronounce that without too much bothering about the vowels), whose north draining twin is called Wet Sleddale; a name and a warning. 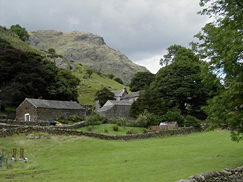 The two featured pictures are of Tony's starting point at the lonely steading of Sadgill, from where he ascended Harter Fell and Kentmere Pike. In Tony's own words, "Well, it's the height of the tourist season, but during my entire walk today I had the fells to almost to myself, meeting less than a dozen other walkers. However, when I got back home to Ambleside the place was absolutely packed! Just goes to show that you can always avoid the crowds if you wish." This weblog visited Sadgill once before, though Dave Newton, whose web site has recently been added to the UK-CAM sidebar menu, was our guide on that occasion. 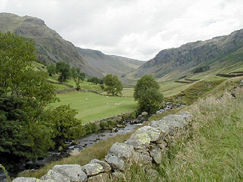 John Dawson has an alternative route description for a Longsleddale Round, with more photographs. Ann Bowker has an archive of pictures taken on her walks in the Far Eastern Fells, and is currently featuring (content may change by the time you visit, but we expect that it will eventually be archived if you search for '27/7/03') a walk that intersects with Tony's on Harter Fell. Andrew Leaney has an exhaustive list of Lakeland fells, which includes his own five ascents of Harter Fell, and three of Kentmere Pike, later entries with pictures and useful maps. Tomorrow the weblog will feature some of Tony's picture of the valley itself, and the often under appreciated surrounding hills. French fashion designer (1936- ). When this man's career was at it's height it was possible to make unPC statements like, "What a woman needs is a black turtleneck sweater, a straight skirt, and a man to love her." His most famous, and most copied, creation was a mini dress based on a Mondrian painting. He was a world class designer in his early twenties, exerting his influence over the fashion world for almost forty years until his retirement in 2002. He was often controversial, posing naked in 1971 to promote a perfume named after him, and binging on drugs and alcohol. He often declared his reverence for womankind, so the 2000 banning of an Opium perfume advertisement featuring naked Sopie Dahl must have been unwanted notoriety: the ad attracted more complaints in the UK than any in the previous five years, and was adjudged to be offensive and degrading to women. He once said, "The most beautiful clothes that a woman can wear are the arms of the man she loves. But for those who do not have the luck to find such happiness, I am there." Perhaps making women's tuxedo jackets with pants was more of a manifesto than just a shallow fashion posture. Before looking at the life of James Bridger, I thought it worthwhile to look at the historical context of his achievements. Three important factors were 'Manifest Destiny', the demand for Top Hats, and 'American Spirit'. 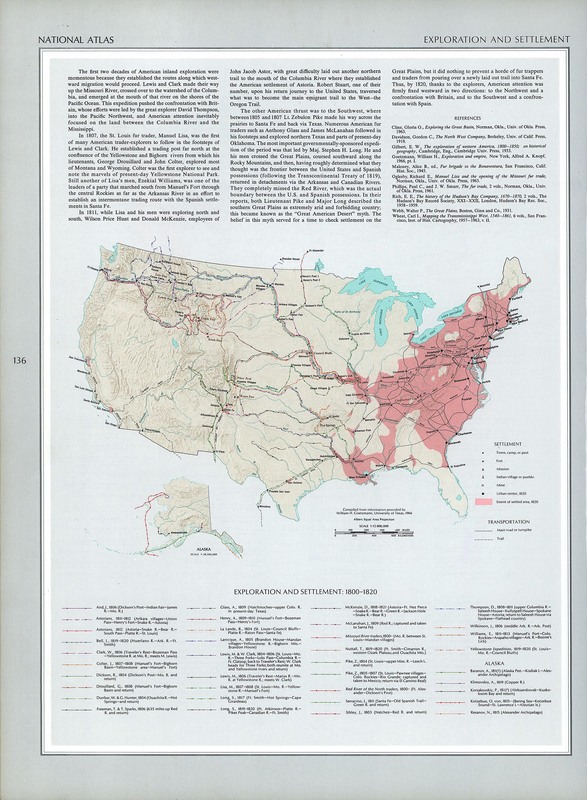 As the nineteenth century dawned the newly created nation of America was looking west beyond the frontier of white civilization to the unknown, but potentially exploitable, lands beyond. Thomas Jefferson, pictured above left, sent Merriwether Lewis and William Clark on the famous expedition. It was not until 1845 that John L. O'Sullivan would use the expression 'Manifest Destiny' when he wrote "".... the right of our manifest destiny to over spread and to possess the whole of the continent which Providence has given us for the development of the great experiment of liberty and federaltive development of self government entrusted to us. It is right such as that of the tree to the space of air and the earth suitable for the full expansion of its principle and destiny of growth." The idea had clearly taken a firm hold long before. The expedition failed to achieve the intended goal of establishing an easy route from the Atlantic to the Pacific, but imaginations were fired. As they returned down river to the confluence of the Missouri and the Mississippi, there were already trappers following the trail blazed by the Corps of Discovery. The prize they sought was the pelt of the beaver, to supply the European demand for Top Hats. The thing that ties all this together is the 'American Spirit' of people prepared to be highly mobile in pursuit of opportunity. The lady pictured is Sandi Browne: with her husband Stan, the tradition of 'American Spirit' continues as they explore America together in their motorhome. Sandi's bio records her life in the air shows when "I also waved at the crowd from the top wing of a huge Stearman bi-plane while it flew upside down close to the ground." Stan's bio records his life in the electronic components industry. 'Average' Americans if such a thing exists. In the picture Sandi models a real beaver pelt top hat in the factor's house at Fort Vancouver, WA the regional headquarters for the Hudson Bay Company. We recommend the following links for further study of these three topics that were to determine the future course of the emerging nation of the USA: Thomas Jefferson's brief biography on the White House website; Manifest Destiny on the Revolution to Reconstruction website; Lewis and Clark on the PBS web site, and on the VIAs web site; Beaver Fur Hats on the White Oak web site (which provides 'living history' interpretations of the fur trade era within the Great Lakes region), and The Fur Trade: Beaver Powered Mountaineering on the Mountain Men: 1810-1860 web site; an excellent (worthwhile 1Mb download -- scrollable graphic) map of the Westward Explorations 1800-20 from the University of Texas online library; and Sandi and Stan Browne's web site, with picture galleries of their travels. This was the second of three parts, all now available in the Jim Bridger archive.